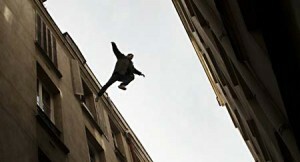 Gilles Lellouche leaps for love in French thriller Point Blank. Gilles Lellouche (Tell No One) stars in the fast-moving 2010 French crime action-thriller film Point Blank, written and directed by Fred Cavayé (Anything for Her). Lellouche is Samuel, a nurse who is working at a hospital when his pregnant wife (Elena Anaya, Room in Rome) is kidnapped before his very eyes before he’s knocked unconscious. When he comes to, he discovers that a dangerous criminal named Sartet (Roschdy Zem, The Girl From Monaco) is responsible, and if he’s ever to see his wife again, he must do Sartet’s bidding. Samuel quickly finds himself pitted against rival gangsters and trigger-happy police in a race to save the lives of his wife and unborn child. The foreign-language movie received a limited released to U.S. theaters in July, 2011, where it grossed a not-bad $700,000.